The world-renowned team of infectious disease experts at the University of Texas Medical Branch at Galveston is at the forefront of the battle against West Africa’s Ebola virus outbreak, providing clinical research, outbreak response and vaccine development. There are currently no vaccines or medicines approved for use in humans infected with the Ebola virus (formerly known as Ebola Haemorragic Fever, which has human case fatality rates as high as 90 percent, and is responsible for some 1,800 cases and nearly 1,000 deaths so far in the current outbreak affecting Guinea, Sierra Leone, Liberia, and the latest — Nigeria, over the past several months. In addition to being a global health concern, the U.S. Army Medical Research Institute of Infectious Diseases (USAMRIID) also considers Ebola a potential biological threat agent. UTMB Professor of Microbiology & Immunology Thomas Geisbert’s research focus is on Ebola virus, Marburg virus, Lassa virus, Nipah virus, Hendra virus; nonhuman primate models; pathogenesis, vaccines, and therapeutics. Dr. Giesbert has been researching Ebola for more than 25 years, including several years with the USAMRIID facility at Fort Detrick, working with the world’s most dangerous viruses. Thin section electron microscopy of infected cell culture and negative contrast electron microscopy of Ebola virus from cell culture diagnostic specimen from the first passage in Vero cells of a specimen from a human patient — this image is from the first isolation and visualization of Ebola virus, 1976. This image has been “borrowed” so often for various public uses that many people think that all Ebola virions look just like this — indeed, in the film Outbreak every virion seen looked just like this. 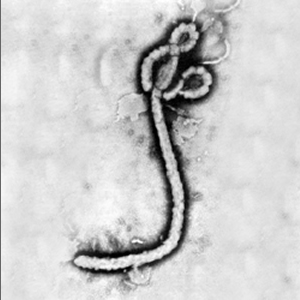 In fact, Ebola virions are extremely varied in appearance — they are flexible filaments with a consistent diameter of 80 nm (nanometers), but they vary greatly in length (although their genome length is constant) and degree of twisting. Negatively stained virions. Magnification: approximately x60,000. Micrograph Credit: F. A. Murphy, University of Texas Medical Branch, Galveston, Texas. Thomas G Ksiazek, DVM, PhD, a professor in UTMB’s Department of Microbiology and Immunology and a member of the Institute for Human Infections and Immunity and Galveston National Laboratory, formerly served as head of the U.S. Centers for Disease Control and Prevention Special Pathogens unit as a leader in global outbreak response around — a role that he has held since the mid-1970s. Dr. Ksiazek will be on the scene of this current crisis to help lead the CDC task force in Sierra Leone beginning this month. Once in the country, he will lead a team of CDC epidemiologists that have been requested by Sierra Leone’s government in order to assist in containing the Ebola outbreak currently underway. Dr. Ksiazek’s role in the Ebola containment is the result of his proven expertise and leadership in the field. He is a leading expert in the epidemiology/ecology and laboratory diagnosis of various hemorrhagic fevers and arthropod-borne viruses. More specifically, his expertise involves the mechanisms of transmission from reservoir zoonotic hosts to humans as well as transmission of viral hemorrhagic fever viruses from case to case, particularly in health care settings. Of recent interest has been the persistence of the hemorrhagic fever viruses in reservoir populations and individual animals. The reservoir host(s) of these filoviruses has been a particular interest to Dr. Ksiazek over the past 20 years, and in the last five years or so has he has focused on megachiropterans. A major focus of this current epidemic is the need for high containment operations and optimal operational biosafety. In all of his similar endeavors, Dr. Ksiazek notes that it his ongoing goal to help create a high containment lab environment that promotes excellence in science while maintaining the necessary high standards of safety and security necessary to work with high consequence pathogens in today’s world. In April, global experts who study the world’s deadliest infectious diseases recognized the contributions of Dr. Ksiazek and his UTMB colleague Professor Frederick A. Murphy with a Lifetime Achievement Award at the 6th annual International Symposium on Filoviruses. The filoviruses include Ebola and Marburg viruses. “This award represents the culmination of a lifetime of scientific discovery and leadership in addressing one of the most challenging emerging diseases of our time,” commented James LeDuc, director of the Galveston National Laboratory (GNL) at UTMB. This expertise and research is made possible by GNL, the only fully operational Biosafety Level Four laboratory on an academic campus in the United States, and also home to the first full-size BSL4 lab located on a university campus in the U.S. Since 2004, the Robert E. Shope, MD, Laboratory has been safely operated on campus, contributing new knowledge concerning several potentially dangerous virus infections of humans. As one of two National Biocontainment Laboratories constructed with funding awarded in October 2003 by the National Institute of Allergy and Infectious Diseases/National Institutes of Health (NIAID/NIH), the GNL provides much-needed research space and specialized research capabilities to develop therapies, vaccines, and diagnostic tests for naturally occurring emerging diseases as well as for microbes that might be employed by terrorists. Products likely to emerge from research and investigations within the GNL include novel diagnostic assays, improved therapeutics and treatment models, and preventative measures such as vaccines. Dr. Murphy, a professor of pathology and a member of the Institute for Human Infections and Immunity, the Center for Biodefense and Emerging Infectious Diseases, the Galveston National Laboratory and the McLaughlin Endowment for Infection and Immunity, was co-discoverer of the filovirus group, and prepared the first electron micrograph showing the curled thread-like image of the virus particles that characterize the filoviruses. Prior to his arrival at UTMB in 2005, he served in a number of prominent positions at the CDC, concluding his career as director of the National Center for Infectious Diseases. One of his unique contributions to infectious disease research and public awareness are a series of images of deadly viruses such as Ebola and Marburg, taken at the cellular level using electron microscopy. Dr. Ksiazek is director of high containment operations for the Galveston National Laboratory, and also directs the National Biodefense Training Center, which provides researchers in the United States and around the world with the skills necessary to work safely with deadly pathogens in high-containment laboratories. He personally led the Centers for Disease Control and Prevention’s on-site response to virtually every Ebola or Marburg outbreak that has occurred in Africa since the 1995 Kikwit outbreak in the Democratic Republic of the Congo. Together they have provided critical insight about the viruses and how to control the outbreaks that they cause. Before he came to UTMB in 2008, he was chief of the Special Pathogens Branch at the CDC, where he coordinated outbreak and control responses to especially dangerous pathogens such as Ebola, Marburg, Rift Valley fever, Nipah and SARS viruses. 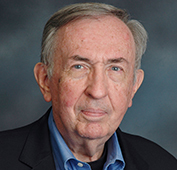 Dr. Ksiazek has been extensively involved for decades in outbreak response and pathogen discovery such as the reemergence of H1N1 in 1977 in Asia and the Hantavirus Pulmonary syndrome and Sin Nombre virus in 1993 in the U.S. Southwest, for which he received a national service award for his work from the U.S. Department of Health and Human Services. He is also co-discoverer of the SARS virus. The International Symposium on Filoviruses began in 2000 and periodically brings together experts from around the world to discuss advances in the diagnosis, treatment, prevention and control of Ebola and Marburg viruses. Filoviruses are transmitted by close contact between infected patients and caregivers rather than aerosols as in SARS and influenza for example. Consequently, it is easier to control with quarantine protocols where they can be effectively practiced, that is often difficult at primitive rural hospitals or clinics in the developing world, where health care workers are frequently the ones at greatest risk of infection, and many doctors and nurses treating these patients have themselves succumbed to these viruses for which there is no effective standard treatment or vaccine to prevent infection. UTMB researchers are working to develop and test new vaccines and broad spectrum treatments for these highly lethal hemorrhagic fever viruses. Dr. Geisbert recently received a $26 million collaborative Center of Excellence for Translational Research grant supported by the National Institute of Allergy and Infectious Diseases, part of the National Institutes of Health, to further this research. Dr. Geisbert will collaborate with John H. Eldridge of Profectus Biosciences, Ian MacLachlan of Tekmira Pharmaceuticals Corporation, James E. Crowe Jr. of Vanderbilt University Medical Center and Alexander Bukreyev of UTMB. The work is enhanced by the capabilities of UTMB’s Sealy Center for Vaccine Development (SCVD), one of the most comprehensive vaccine development centers in the world, whose researchers are investigating new ways to treat infectious diseases of every type, from new strains of influenza to emerging diseases from every corner of the globe, including hemorrhagic fevers like Ebola, Argentine hemorrhagic fever, Crimean-Congo hemorrhagic fever, Lassa fever, Marburg and Rift Valley fever. Located on historic Galveston Island, Texas, the SCVD was inaugurated in December 2001. With 80+ faculty members from twelve School of Medicine Departments, the center incorporates the expertise of more than 100 research programs currently at the University of Texas Medical Branch (UTMB). The faculty and staff of the SCVD strive to create, perfect and promote the most effective and safest disease prevention strategies. In this endeavor, the center carries on the proud tradition of medical research and discovery that has been a hallmark of UTMB since its beginning. In addition, SCVD’s clinical trials group undertakes a variety of phase I, phase II and phase III studies in populations from neonates to senior citizens. Members of the center also examine influences on vaccine acceptance and uptake, and address issues relevant to the development of public policies governing health care, and facilitates education and training in vaccinology for graduate students, postdoctoral fellows, and physicians.